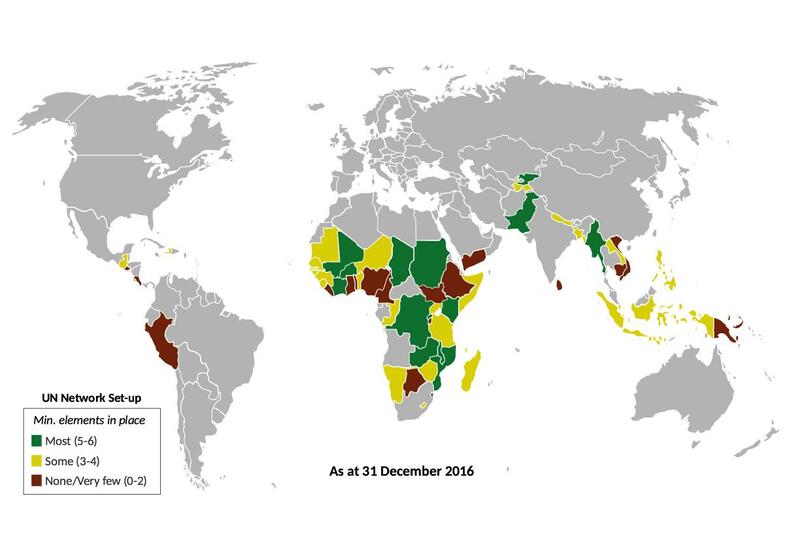 Through increased UN coordination and convergence, the UN Network helps participating agencies harness the full impact of their actions to help countries accelerate progress towards national nutrition targets. Source: UN Network for SUN 2016 Reporting Exercise; UN Network for SUN Contact List; & bilateral exchanges. Launched in 2016, the portal provides a platform to collect, visualise and share key data on the UN Network. This includes reporting data, which captures the state of the UN Network, and informs the development of country UN Network dashboards. Similarly, the reporting data feeds into an aggregated analysis, illustrating trends, gaps and opportunities for increased harmonisation and convergence. 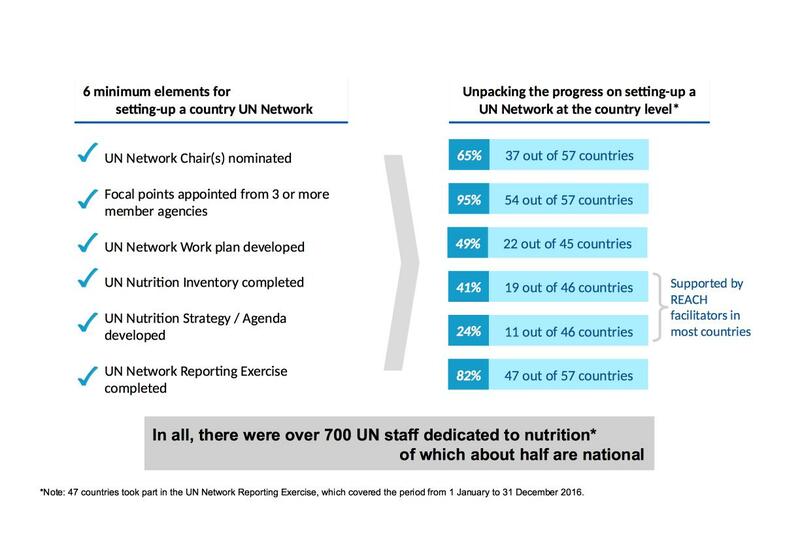 In addition, UN Network progress is highlighted in seminal global reports, which ascertain how the UN Network’s collective contributions (including those of REACH) are supporting greater nutrition results under the SUN Movement’s MEAL framework. REACH lends directly embedded support to SUN focal points and nutrition coordination structures on nutrition governance, particularly strengthening capacity for effective multi-sectoral, multi-stakeholder coordination. Countries call upon REACH to bring momentum to SUN processes and networks, most notably the UN Network, in order to accelerate action. 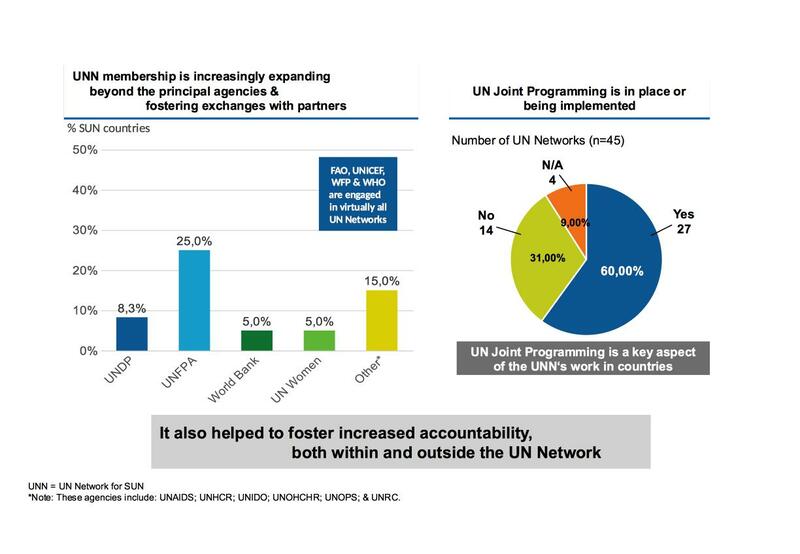 REACH results feed into the contributions of the greater UN Network in support of all five UN Network outcomes. Independent REACH evaluations have supplemented internal M&E mechanisms and identified where it is performing best. They have also provided strategic insights about the factors driving those successes, and guided the evolution of the REACH model. For additional information, visit the REACH webpage.